The intent of the Strategy Pattern is to define a family of algorithms, encapsulate each algorithm, and make them interchangeable. The Strategy Pattern lets the algorithm vary independently from clients that use it. In addition the pattern, defines a group of classes that represent a set of possible behaviors. These behaviors can then be used in an application to change its functionality. The figure below illustrates the Strategy pattern. StrategyContext aggregates abstract Strategy class. 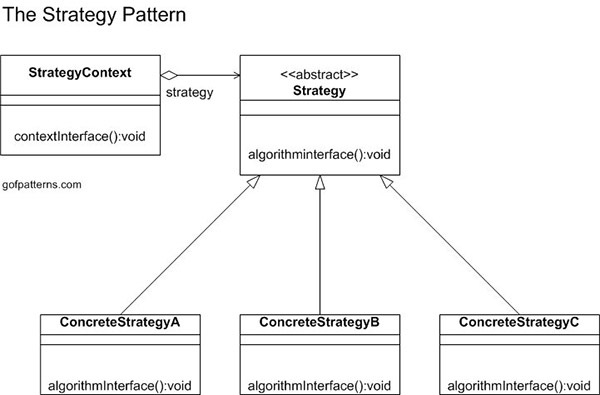 Three concrete class implementations inherit from abstract Strategy. Many related classes differ only in their behavior. You need different variants of an algorithm. An algorithm uses data unknown to clients.